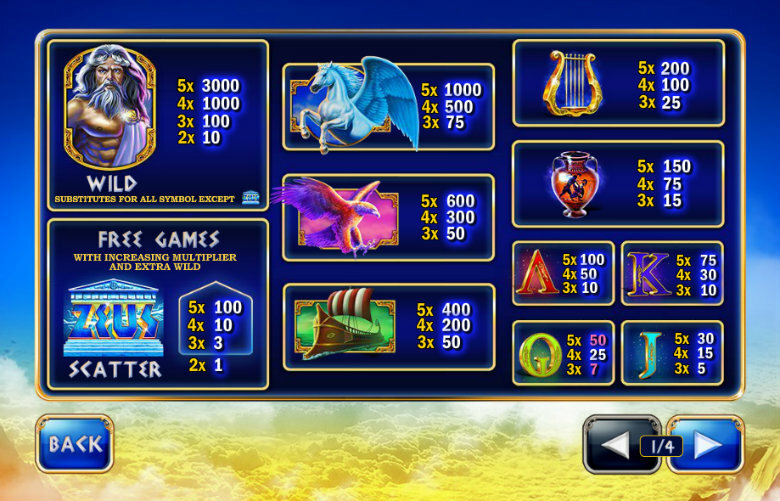 Age of the Gods: King Of Olympus is a jackpot slot based on Greek mythology. Not only will Zeus be on your side in trying to help you make additional wins but you could win one of four progressive jackpots on any spin. This beautifully crafted Playtech slot has a suspenseful score and offers great entertainment on both mobile and desktop devices. Age of the Gods: King of Olympus online slot is not a difficult game to play but it’s always best to find out what you’re dealing with before spinning the reels. Click ‘Info’ in the bottom left to learn about the special features and view the bet line mappings and prize symbol values. You’ll see that Pegasus is the highest paying standard symbol. Get 5 of a kind for a return worth 1,000x your bet line stake. Wild symbols are represented by an image of Zeus and can substitute for any other symbol, except scatter symbols. Wilds can also combine with one another for a return of up to 3,000x your bet line stake for 5 in a row. In order to make a winning combination, matching symbols must appear in succession from left to right on a bet line, starting at the leftmost reel. Scatter symbols are the exception to this rule and can combine anywhere on the reels. 2 or more scatters will yield a return which is added to any bet line wins. Scatter wins are relative to your overall bet, with up to 200x your stake available for 5 scatter symbols. They are also used to trigger the free spins game, which is initiated when 3 or more scatters appear. You will be awarded 10 free spins which begin with a x2 multiplier. Every 2 spins, the multiplier will increase by +1. All wins in free spins will have the current multiplier applied. On top of this, an additional wild will remain fixed in the centre of reel 3 for the duration of free spins. Entry to the jackpot game is entirely random and can occur on any winning or losing spin. There are four jackpots ranging from small to large prize amounts; Power Jackpot, Extra Power Jackpot, Super Power Jackpot and Ultimate Power Jackpot. The cost of the spin will not affect how much you can win but your chances of entering the game improve with higher stakes. It’s pretty much a repeat of the other bonus game except that entering the jackpot game guarantees a win. Pick from 20 coins to reveal one of four jackpot symbols, with the prize awarded relating to the first 3 matching symbols that you select. Setting up the game only requires one setting to be altered. Use the ‘+’ & ‘-’ buttons to set your bet line stake, noting the cost of the overall bet as you do so. You can then either click ‘Spin’ to play the game manually or ‘Autoplay’ to initiate up to 99 automatic spins. You can customise the way the game plays to suit your personal taste. ‘Turbo Mode’ will deactivate animations and make the reels spin faster. You can control the overall volume with the speaker icon in the top-right or access an options menu by clicking the spanner. Here you can disable certain messages and initiate fast play. You can also toggle the use of individual sounds and access a help menu for further game rules and instructions. 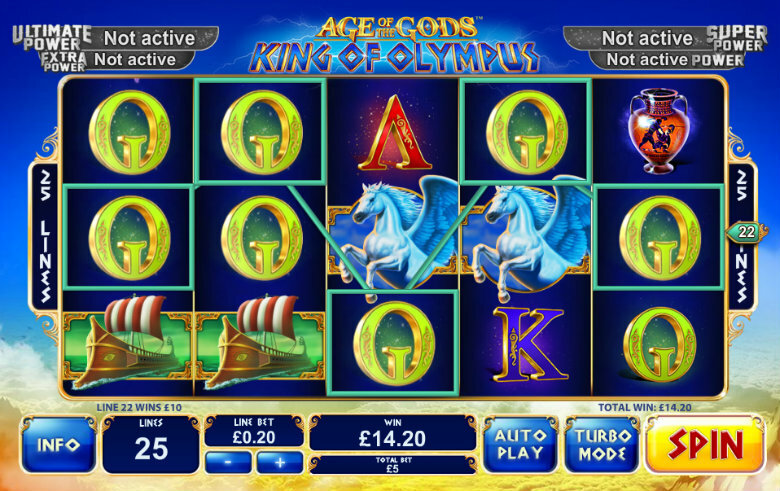 You can play Age of the Gods: King Of Olympus at most Playtech casino operators such as Ace Kingdom for example. It’s not a slot that features in any welcome packages but you can play it using bonus cash if you wish. In fact, it’s a suitable game to play if you wish to play through the wagering requirements of a casino bonus. This is because it tends to pay out small to medium prizes frequently enough to theoretically keep your balance topped up while completing the wagering. The base game offers mainly low-key wins but you can get some big payouts from the most valuable symbols. For instance, 5 wilds will return 3,000 your bet line stake and 5 scatter symbols will return 200x your overall bet for that spin as well as triggering the free spins game. This is where the bigger wins are lurking as the aforementioned returns can end up being multiplied by up to x7. Plus you are more likely to make winning combinations because of the sticky wild on the third reel. The progressive jackpots are seeded at €50, €500, €5,000 and €100,000 respectively and continue to grow until won, so entering the jackpot bonus game gives you a genuine chance of winning a life-changing amount of money. Is Age Of The Gods: King Of Olympus The Right Slot For You? Age of the Gods: King of Olympus video slot is a low to medium variance game that will appeal to many slot players. Not only will you benefit from a relatively high frequency of small wins but there is potential to win big too. In that sense, this slot offers the ‘best of both worlds’ with low-risk play and the chance to win a staggering sum of cash. The return to player (RTP) is 95.98% but when removing the jackpot contribution this falls to 94.99%. The casino will therefore, have a house edge of 5.01% which is by no means terrible but there are more favourable jackpot slots around such as Cosmic Fortune for example. The animations in the base game look pretty neat but we were most impressed when Zeus exacted his power as the god of thunder and lightning to strike the multiplier with a lightning bolt during the free spins game. You’ll also get that buzz of anticipation when waiting for a third scatter symbol as the reels spin on for longer with a crescendo of noise to really ramp up the excitement. Age of the Gods: King of Olympus is likely to appeal to any slots player with an interest in Greek mythology. If you like the theme but want something with a higher variance then we suggest Age of the Gods which is another release from the same series of Playtech slots.